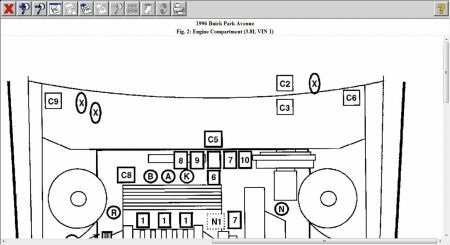 Technical Car Experts Answers everything you need: Blower motor problem on 1996 Buick Park Avenue? Blower motor problem on 1996 Buick Park Avenue? You will see alphabet B -- A---K .Above that there is relay number 8 and 9.Remove and check that relay. If relay checked out fine and tested good.Then check the red and purple( bit pink looking) wire. This both wire connects at high speed blower relay socket.Check continuity for both this wires.Any of the wire is got loose or shorting. Also check the blower motor resistor.The resistor wiring is shown in the diagram.Its dark blue wire going from resistor to high blower motor relay. Labels: Blower motor problem on 1996 Buick Park Avenue.